Art Primo Reviews by Johndee - A Top 100 Reviewer! All the reviews by Johndee - A Top 100 Reviewer! These guys are the Schnitzel! Personally I couldn't be happier that Artprimo picked these up. I have used the blacks for a few years now and don't leave the house without them. great for hitting a quick spot or just practicing hand styles. these are the closest thing to the Old Magic Markers I had as kid, (before computers.) Heck if your a Bode' fan and want that vintage look to your artwork get a full set of these and Wizard/Broad it up. This company makes quality stuff the nibs hold up for a good bit (as long as you not trying to write on concrete) and you can get replacements if needed. this is a graphic style marker so its not meant to beat any Buff Man. the ink holds up well on street side signs and glass and these are the perfect size for eggshells and the ink does great on them. and if you run out they can be refilled. The Magic ink ?marker is great for a beginner or novice. the price is just right and being able to get all the colours makes it even better, heck if you like them you can pick up refills and never have to buy another. Big Thanks to Artprimo for getting these if your like me and dont live any where near a Chinatown you know all about paying thru the nose and waiting 2 months to get one of these in the mail. hopefully these will stay around for a while! I wanted to do the Pepsi challenge with the .901Paint so I picked up the "Hot Pink" personally I like colours that work on light/dark surfaces. also I have the pink .401Paint, I dont know if I would really call the.901 a Hot Pink but Fuchsia. 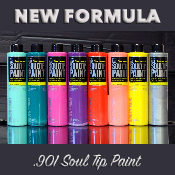 The smell is almost NON-existent with the new formula and its a heck of alot easier to open than the .401Paint, I used a OTR.006 Soultip and I haven't had any streaking, and It writes really easy on smooth surfaces, I had to use a lot of pressure to get heavy drips (I leave the regulator in the Nib) but definitely more pressure than the .401 Paint. As for Dry time the Drips took longer to Dry than the .401Paint I have. I can't speak for the other colours but the Hot Pink has more of a satin sheen to it unless you manage to flood the Tag. As for being opaque it is very bright for the most part on dark surfaces. Marker Ink wants to leach through the .901Paint I have noticed, after going over some previous Ink pieces it turned the Hot Pink muddy and unreadable. The .901Paint does flow better in the nibs of pump markers like the .060/,160 than the .401Paint did. Daily writing in FL weather for a week and its been Up and Down. It's really been a 50/50Paint so far. Its all a matter of figuring out what it works on best. Its worth the purchase, its a nice price for the amount. I really hope AP sells these guys forever, I've been using these Nibs STEADY for over a year. I carry an 8mmMarker with me everywhere. Believe me when I say this Nib holds a sharp line well, while lasting a good minute. they work great on Paper,Vinyl,Eggshell Blanks,Black books and Outdoor use is no match either. A lot of inks work with this Nib, like the ES-3 Ink/OTR-Flowpen,Hard to Buff/Molotow-Speedflow,Transformer/Grog-BPI. This Nib size is perfect for for Handstyles and works great for practicing Russian Vyaz & Calligraphy styles. 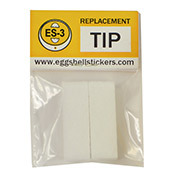 This Nib isn't just for the ES-3, it also fits the OTR-Street Taggers and Grog-Cutter08xfp. Personally, I can't say enough good things about these nibs, they hold up so amazingly well. I use these Nibs in an OTR.030 and some Molotow Transformer Black Ink I picked up at ARTPRIMO a year ago and its been in my pocket every day, the combo hasn't failed me one bit! Thanks AP its been the best year ever! !!!Bonus!!! Hold on to the label, its actually an Awesome "HONG KONG PHOOEY" Eggshell Sticker! This little guy is a lot of fun. First thing tho' DON'T expect to get the hang of it right away. if you dont like it no big deal, pick up a $.99 7mm nib when you buy this and you can still use it. That said, when you get the hang of the roller ball it can be great. It helps to keep it filled, paint is the best thing for this. Personally I have had no luck with inks. This guy is a happy medium mop. Angle, Pressure, Speed. Your not going to get a crisp line with this like you would a standard mop. you will get some blowouts, some flooding. but be creative use that to your advantage. The ball bearing is super smooth and needs a little bit of a toothy surface to write on like painted rusty metal, weathered wood, brick/concrete, the only real way to get a steady even flow is vertically. 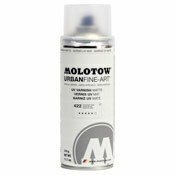 you can use this on granite window ledges on old builings/banks/schools/police stations/parking blocks. Sure you could use this on the ground, but I just don't like the idea of any one walking all over me, and why should you. -TIP- If you press to hard the ball will stop moving. Practice on he boxes you get from AP. I got the Black trade and was impressed. this isn't a paper marker it's made for street use. the Black Ink bleeds through buff, they Buff every day here and I watch them and that guy was mad. Think Speedflow Ink family. 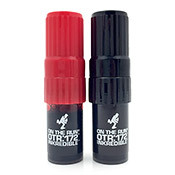 The marker is a straight forward OTR short body. I used a 15mm. but the ink can handle the 20mm. just fine. I had no streaking on metals and glass. Don't flood the nib when you pump this the Ink wont come off easily and your caught for sure. In close quarters the smell will get you noticed too. I can't speak for the Red but the get the Black, If your out every night its worth the money. so is the full size. Any one that has worked a Construction or Shop job will know this ink from the smell. Review 22/ Jan/ 2016 - Used this for 2 months... 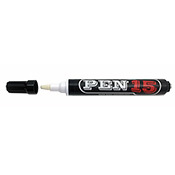 I dont know if AP got a new batch of these but this marker is a good writer. great on name badges and Eggshells, the nib is the reversible Side 1- round flat tip, Side 2- a flat chisel w/ no bevil, so it's great for Calligraffiti/Handstyles. This marker comes filled with Ink, the flow was fine some streaking but thats what scrap papers for. You can open the nib a little, don't go crazy with the hammer. Ink is dark like a New Sharpie and writes about the same. After 2months In direct sun light we got some fading (FLORIDA tested) that's expected, if you haven't hung new blanks up in 2 months, your slacking. 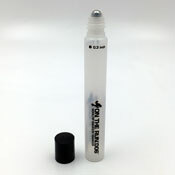 -Personally, This is a good beginners marker to learn on or a great practice pen for Handstyles. So If your new to Writing I would pick-up the AP-P15 over a Krink-K70/71 and spend the saving on a good mop! I go for function, before hype.